I saw this amazing piece of art last week, in Colmar, Alsace. It was painted by the German painter, Matthias Grunewald, on the eve of the Reformation. See the angelic choir glorying in the birth of Christ. The lute of the angel in the foreground has the shape of a human face!! And here is Lucifer, seemingly unable to resist viewing the incarnation of the Glorious One as a baby. 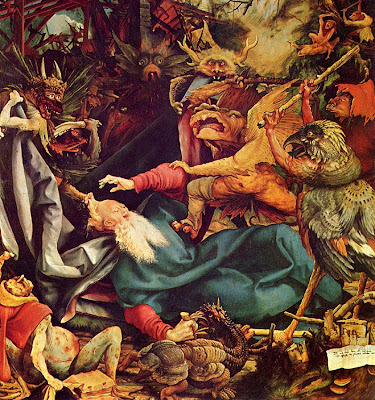 Monsters seemingly out of Brueghel’s imagination assault St. Anthony.